I joined the Guild family last year when I got a great deal on a 1984 F-50R on Craigslist. I love everything about this guitar and she is built like a tank. No structural problems but there are issues with the pickguard. I know that sometimes they will shrink but the gap where the pickguard meets the neck is pretty large and it makes me wonder what really happened. Many pictures of F-50R’s from this era seem to have black pickguards instead of the tortoise shell one like mine. She can’t talk to me so I am asking the Guild community to help me out. What did her past boyfriends do to her before she met me? Is this the original pickguard? Do you think someone replace it and did not measure right? Did pickguards come in both black and tortoise shell that year? Will keeping it on cause future problems? Do all F-50’s have the same size pickguard throughout the years? Where is a good place to get a replacement if I want one? Last edited by SteveT; 03-19-2019 at 02:34 AM. Congrats on a sweet F50! Original pick guard appears to have been replaced with a wrong size / shape pick guard. some pick guard material from StewMac and try making your own. The replacement pick guard on the guitar would need to be carefully removed. If not DIY, any good guitar shop can likely take care of it. Last edited by Bonneville88; 03-19-2019 at 03:52 AM. Hey Bonneville 88 - Thanks! Great information and pictures. I knew something wasn't right with that gap. I am going to look for a good luthier around Sacramento to help me out on this one. This would be my first pickguard replacement and if it was a lesser model guitar I might take the chance of experimenting but not with this one. I am not interested in getting her back to absolute original specs and I really like the look of a black pickguard on this guitar. Especially with the white pegs with black dots. The people on this forum are the best. 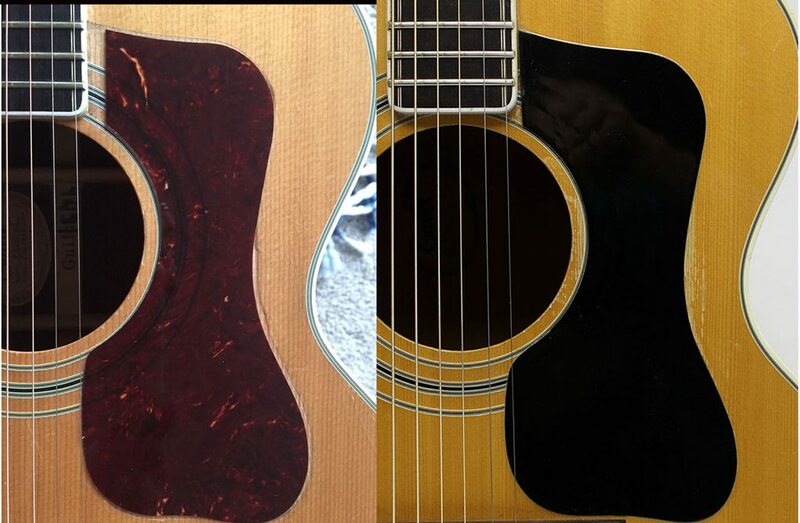 fretboard ends relative to the sound hole on your '84 vs my '78. Looks like your original pick guard was the same contour as on my '78. Last edited by Bonneville88; 03-19-2019 at 01:58 PM. ...Looks like your original pick guard was the same contour as on my '78. Yeah, it looks to be the right shape, but a piece near the fretboard was cut off or something. As you say, Steve, take her in and have a new pickguard put on - just big enough to cover the discolorations. And have it meet the fretboard, of course. The fix will not have happened until we see new photos! Just live with it, It's not that big a deal? It's definitely an D35 pickguard and a real pretty one at that. The Mc Guyver in me says artfully cut a little scrap of pickguard material, and glue it in. Way easier and cheaper than redoing the whole thing. I'm sure I can find it, send you a scrap, it will match. You'll be the only one to know, probably the only one to care anyway. I used real strong double sided tape, worked amazing. Trace and cut out your piece, place it, hinge it with blue tape, peel the backing off the tape, lay it back down, press, remove blue tape, done. Or, get a sheet from Hans if he still has one, and go through the process. Finding the correct guard for an old Guild wasn't a thing when I was looking for one. Last edited by Guildedagain; 03-19-2019 at 03:33 PM. Yup, totally agree with Cougs. That was a pretty poor job replacing that pickguard, whoever did it. Pretty easy fix, Steve, provided the guard that's on there was affixed with proper adhesive. It wouldn't surprise me if it wasn't though, in which case I'd leave it alone rather than pull up fretboard wood during removal. When I did get the guard off the D4-12, someone had been under there before, did horrible things to the area, which can be buffed out but never be undone, but it does get covered over. If your eyes are good enough, you can see the top damage through the guard after it shrinks into the top some, this would be through the thin tortoise material. Doubt it but possibly Guild themselves used off-spec color if necessary. They were pretty lax about stuff like that, we see it all the time. If you want to be period correct suggest doing some google image searching, but I recently tried to ID the vintage of an F50 form photos myself, and my memory is that yes late '70's to early '80's showed black guards. THEN when the models got the new "JF" numbers (JF65 for the F50) ca '87-9, they had tortoise 'guards....UNTIL they got an abalone rosette ca '94 at which time they went black again. So varied over time and as others showed, even the shape varied. Last edited by adorshki; 03-19-2019 at 07:55 PM.